Steller sea lions (Eumetopias jubatus; abbreviated as Steller's for this webpage) range from Siberia to California and all the coastal areas in between. Populations in the east, from Oregon through Southeast Alaska, are doing well- their numbers have increased about 3% per year since the 1970's. But to the west, populations haven't fared as well- in some areas of the western Aleutian Islands they're down more than 90% during this same timeframe. Additional details on status and trends can be found on the Steller sea lion species profile page. Researchers from several organizations, including the Alaska Department of Fish & Game (abbreviated as ADF&G or Fish & Game), have been studying what causes these population variations but so far there is no single smoking gun. Much like John Muir's observation that "When we try to pick out anything by itself, we find it hitched to everything else in the universe" the ocean is one vast interconnected web with everything contributing in some way. 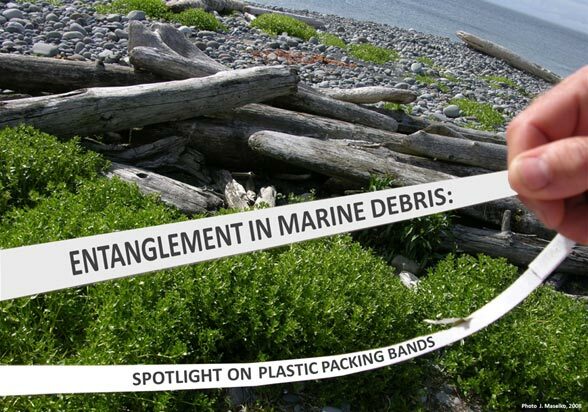 Entanglement in marine debris could be one such contributor, albeit a small one, as it is a known causative factor for marine mammal injury and mortality. You might be asking yourself "What is marine debris?" Well, marine debris is any manmade object that purposefully or accidentally ends up in the marine environment. Seals and sea lions are highly spirited and inquisitive which increases their likelihood of encountering marine debris in their environment. If there are loops in this debris, Steller's can be especially susceptible to getting entangled and receiving severe, life threatening injuries. Fish & Game biologists have been photographing sea lions entangled in marine debris during the course of our vital rates research. Plastic packing bands are the most common identifiable neck entangling material, followed by rubber bands, net, rope, and monofilament line. "Lose the Loop and Stash the Trash!" We have documented entangled Steller sea lions of all ages and genders. The most common identifiable entangling materials are plastic packing bands.